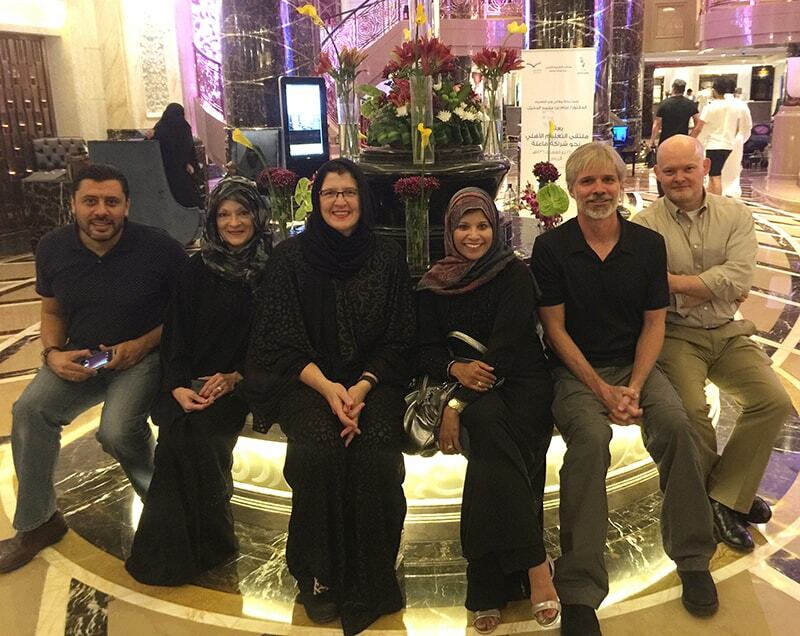 The UAMS team enjoys dinner with their host Emad ElMaghraby (left) at the Narcissus Hotel in Riyadh, Saudi Arabia. Team members are Sherry Johnson, (second from left) Mary Cantrell, Sara Tariq, M.D., Michael Anders, Ph.D., and Travis Hill. 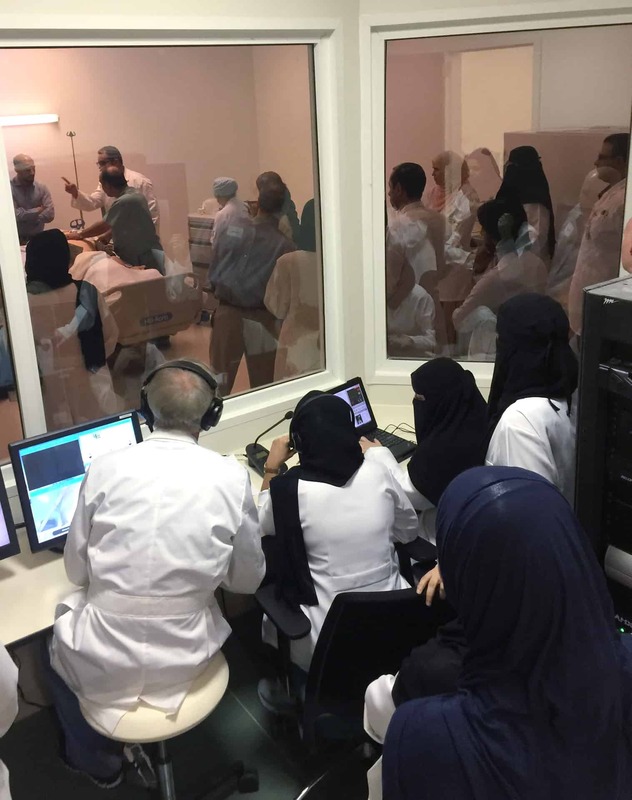 Dec. 3, 2015 | Dec. 3, 2015 | When Mary Cantrell and the simulation education team at UAMS were offered the opportunity to train the staff at Princess Nora Bint Abdulrahman University in Saudi Arabia, they jumped at the chance. The UAMS team included men, and Princess Nora is the largest all-women university in the world with more than 52,000 students. The school is also located in a country where women aren’t allowed to associate with men who aren’t related to them. Fortunately, with a few modifications by both the visiting team and their hosts, it wasn’t an insurmountable obstacle. Michael Anders, Ph.D., (bottom left) oversees the first simulation run at Princess Nora University. So at the beginning of September, the UAMS team headed to Riyadh, Saudi Arabia. Cantrell, the executive director of the Centers for Simulation Education, was joined on the trip by Michael Anders, Ph.D., the center’s director of education and research; Sherry Johnson, a certified healthcare simulation educator; Travis Hill, director of simulation technology; and Sara Tariq, M.D., medical director for the Clinical Skills Center. The UAMS employees spent nearly five days teaching the Princess Nora simulation team and others how to use their top-notch equipment. “Their facilities were amazing,” said Cantrell. “In our simulation center at UAMS, we have five or six full-body simulators. They have about 90,” each of which cost about $50,000 to $80,000. Hill estimated that the center had between $6 million to $9 million in equipment that wasn’t being used. Cantrell said a lack of training was the problem. 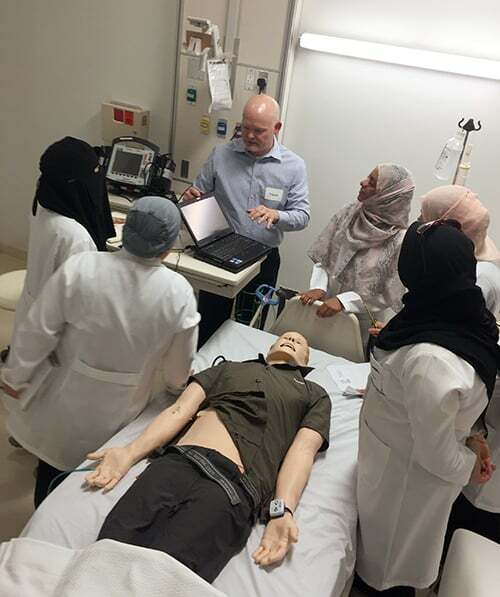 Travis Hill (center) gives technical instruction to the simulation technicians at Princess Nora University. The UAMS crew split into two groups for the training. Hill trained the technicians on how to use the technology, while Anders and Tariq taught the educators how to teach simulation education. Cantrell and Johnson floated between the two groups. For the first two days, they trained the 16 women who will run the simulation center. After that, those women helped the UAMS team train another 50 people, who were either university faculty or worked at the campus’ 400-bed hospital. The campus, which houses students, their spouses and children, has a population of 65,000, about the size of North Little Rock. While the team from UAMS spent their days training at the university, they spent their evenings enjoying the food and architecture of Riyadh. The group even got to try free-range, organic camel, which was served with spaghetti and rice and tasted like pot roast, Cantrell said. Culturally, the United States and Saudi Arabia are worlds apart. Saudi Arabia is a strict Islamic country. As such, women aren’t allowed to drive and are required to be chaperoned when out in public. They are expected to dress modestly, which includes an abaya, which is a cloak, and a hijab, which is a head covering. Many women in Saudi Arabia also wear a niqab, which is a head covering that includes a veil to cover the face. 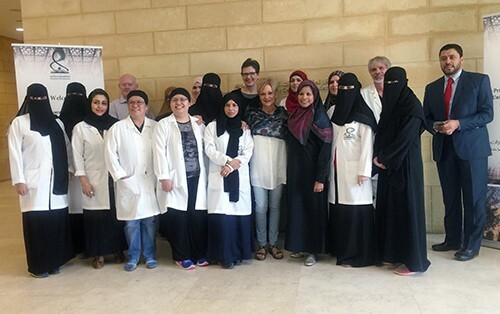 The simulation teams from UAMS and Princess Nora University developed a wonderful working relationship, said Mary Cantrell, executive director of the UAMS Centers for Simulation Education. As a matter of respect, the female members of the UAMS team wore hijabs while they were in public. Their hosts encouraged them to remove the coverings once inside the university so they would be more comfortable. The presence of men at the university also required adjustments for the Saudi hosts. Typically, women at the university are allowed to remove their hijabs once indoors and walk about freely. While the UAMS team was visiting, signs were put up warning women to keep their heads covered because men were present. During lunch times, the male members of the team also were encouraged to eat first and then leave the area so that the women could eat as a group, which allowed them to be more at ease. The cultural differences didn’t keep the two teams from having a wonderful working relationship, Cantrell said. “The great thing about these two teams is we accepted each other,” she said, adding that the experience was so successful that she believes the UAMS team will be invited back to conduct other training sessions.